Karoo Sun Guesthouse is not your ordinary B&B. 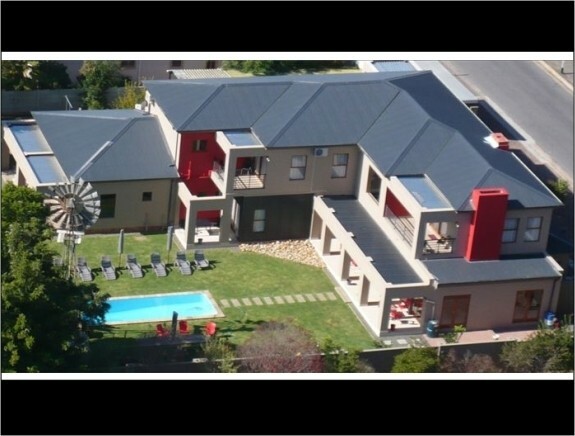 If you are looking for a guest house that can offer you stylish and modern accommodation, combined with a cosy lounge area, an inviting pool and good food, then look no further. If you are looking for a guest house that can offer you stylish and modern accommodation, combined with a cosy lounge area, an inviting pool and good food, then look no further. We have a liquor licence and serve breakfast as well as dinner. Air-conditioning DSTV, and 100% cotton percale linen are part of the package to make your stay even more pleasant. Karoo Sun Guest House is situated in Oudtshoorn, within walking distance of restaurants, hospitals and shops. Surrounding towns like George, Mossel Bay and Prince Albert are just a 45 minute to 80 minute drive away. This makes Karoo Sun the ideal location from where you can undertake your day trips. Karoo Sun is owner-managed by Reynhardt & Hermien Brittnell.